For control applications, the optional set point/relay module provides on/off and differential gap control and annunciation using two Form-C relays and three set points. One of the set points can be configured as either a LO-LO or as a HI-HI. The other two set points function as a LO and a HI. 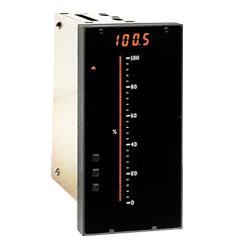 The optional temperature measurement module makes the instrument a direct-reading indicator for E, J, K, and T thermocouples, or 100-ohm RTD. An optional digital display reads to 10 percent over-range and under-range.